The Maritime Cover Deposits are a group of Upper Paleozoic (Devonian, Mississippian, Pennsylvanian, Permian) and Lower Mesozoic (Triassic, Jurassic) deposits found in the Canadian Maritime provinces as well as Rhode Island and Massachusetts. They were deposited after the Iapetus Sea closed and Laurentia (Proto- North America) had fused with the microcontinent of Avalonia. Shortly (geologically speaking) thereafter, the Rheas Sea between Avalonia and Gondwana (Africa,South America,Australia,Antarctica) also closed. The result was the "supercontinent" of Pangea. All of the rocks in the Maritime Cover were deposited on top of Avalonian or Iapetus sea bottom beds and thus are in the same positions relative to the rest of North America as they were when they were deposited. They are quite possibly the remnants of deposits that were contiguous with those of mid-continent North America the intervening deposits in New England and New York having subsequently been removed by erosion. In the Late Paleozoic the Iapetus and Rheas seas that had separated the Earlier Paleozoic continents of Laurentia and Gondwana, finally closed. Although there were almost certainly mountain ranges pushed up in Eastern North America during that time interval, the surviving rocks are sediments and associated intrusives deposited in coastal plain and near shore environments. As with mid-continent North America, there are marine sediment layers in the Mississippian that become thinner and less frequent as the rocks become younger. By the Upper Pennsylvanian, the sediments are entirely continental. Maritime cover rocks are found along both shores of the Bay of Fundy, In Western Cape Breton Island, in a broad swath running Northwest to SouthEast across New Brunswick, and all of Prince Edward Island. A separate outcrop occurs in the vicinity of Sydney on the North Shore of Cape Breton Island. Carboniferous basins are also found in a narrow strip in Western Newfoundland. A small, mostly covered outcrop of Triassic rock occurs near Guysborough in Eastern Nova Scotia (Chedabusco/Orpheus Basin). Carboniferous cover rocks are found in the Narragansett Basin in Rhode Island and adjacent Massachusetts. Additional Carboniferous rocks occur in basins in East Central Massachusetts. Late Triassic and Early Jurassic rocks associated with the opening of the modern Atlantic Ocean are found in the Connecticut River Valley and in basins South as far as South Carolina. They will be described in the Triassic Basins Terrane. In general, the rocks of the Maritime Cover sequences appear to be near shore marine and near shore swamp and coastal plain sediments. Sandstones, siltstones, limestones, and conglomerates are all present as are coal layers in some places. Some sequences are several kilometers thick. Some volcanic rocks are present in some formations. Many of the sediments were severely deformed/altered during the final closure of the Rheas Sea in the Permian (Allegheny Orogeny). There may have been additional alteration during the opening of the modern Atlantic Ocean at the end of the Triassic. Marine beds become increasingly scarce as one moves up in the sequence. Carboniferous fossils are mostly plants and a few associated arthropods. They resemble those of mid-continent North America. Permian, Triassic (and Jurassic?) fossils are mostly plants and some associated vertebrates and invertebrates. Some of the coal deposits are commercially exploited. No recommended localities. Collecting of mundane specimens along the West (and North?) coasts of Nova Scotia is currently permitted as is collecting at inland and coastal sites in New Brunswick and Prince Edward Island. Over 300 plant species are said to have been identified in the Rhode Island formation which covers much of that small state as well as parts of adjacent Massachusetts. But much of the area is densely populated and exposures are limited. 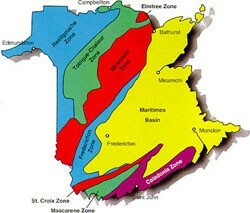 There appears not to be any bedrock geology map of Prince Edward Island currently available on line. Copyright 2006-2012 Donald Kenney (Donald.Kenney@GMail.com). Unless otherwise stated, permission is hereby granted to use any materials on these pages under the Creative Commons License V2.5. This page will have been validated as Valid HTML 4.01 Transitional prior to posting on the web site. W3C Logo Image omitted.